Gillis had been working on crafted gifts for conference packages since 2004. In 2008 she woke up with “Nandos!” screaming in her head, so at 2am that morning she Googled Nandos and saw that the restaurant was celebrating its 21stbirthday – she took it as a sign. Gillis contacted former Nandos CEO Robert Brozin with the proposal to partner with Nandos and sell handmade bracelets that would raise money to feed orphaned and vulnerable children. Brozin agreed and Gillis got an order to make 600 bracelets. 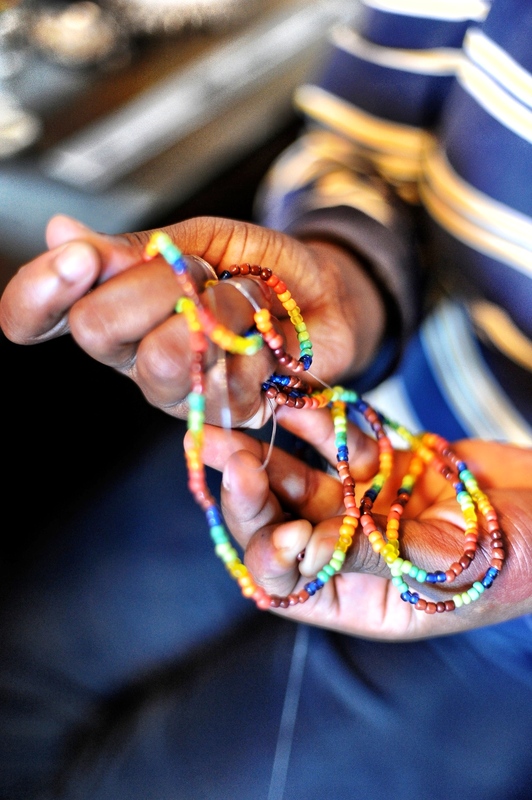 With the help of her domestic worker, Gillis found unemployed elderly women from townships who were willing to bead the bracelets. During the 2010 FIFA World Cup, Nandos got involved in working against malaria, resulting in Relate’s first United Against Malaria bracelet. Soccer stars promoted the United Against Malaria campaign and to date, R8.5m has been raised in four and a half years. “Those were the humble beginnings and we’ve gone from strength to strength,” says Neil Robinson, who joined RelateBracelets as its CEO last year. After 23 years in the corporate sector, Robinson says he wanted to make a difference to other people’s lives and his own. He calls it his version of a mid-life crisis. 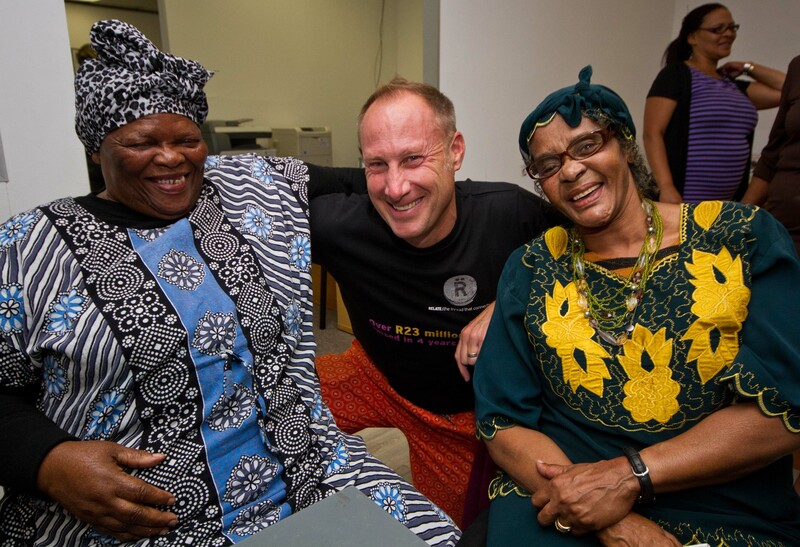 HANDMADE: CEO of Rekate, Neil Robinson with two of the women, Thembeka Mguqulwa (left) and Alicia Radasie (right) who bead the bracelets. Cape Town-based Relate still collaborates with corporates like Nandos and charities to create awareness of important causes. Bracelets are designed to match the brand DNA or the specific cause, explains Robinson. Some brands and causes differ, but all designs are intended to establish a long-term identity. Each bracelet is priced at R35. A third of the proceed goes towards covering the cost management of the organisation. Another third goes back to the community, which includes the 300 women that bead the bracelets. These women often take care of orphaned, HIV positive children, some of whom they are not related to. Some of it is invested in skills development and upliftment programmes for youth in Cape Town’s townships. Currently 27 matriculants – who have few employment opportunities – work for Relate while they receive skills training. They do courses ranging from medical and social work to soccer coaching. The plan is to empower these matriculants to find careers beyond Relate in the future. This third also includes enterprise development. Of every bracelet sold, R3 goes toward supporting the development of small businesses that have been able to establish a footprint, but need assistance to grow. The final third goes to charity partners, such as United Against Malaria, Endangered Wildlife Trust, Reach For A Dream and the Amy Biehl Foundation. About 65 different charities are supported by Relate. Causes are selected through a process of due diligence, says Robinson. Brands that are equitable, have a ‘solid reputation’ and have transparent financial records are selected. Bracelets are sold via various retail partners, such as Woolworths, Foschini, Clicks, Sorbet and the Protea Hotels group. The various distribution outlets are critical to Relate’s success, says Robinson, as they ensure income annuity. Retailers receive a small margin of the sales. The wholesale price is R25 and the standard sale price is R35. Every cent is accounted for and Relate is run as a commercial organisation. A lot of the retailers invest the proceeds in Corporate Social Investment projects. “Good begets good,” says Robinson. The real value for Relate, however, is not in the R35, but in connecting to people and conveying its message. This echoes Gillis’ initial vision. “[The bracelet is] actually not worth anything, but it’s worth everything,” says Robinson. People are connected by the experiences they share with the causes, whether it’s breast cancer, mental illnesses, or endangered species. Relate does not receive donations. Ironically, it donates funds towards an enterprise development project by Nandos. “In what day and age do you have a non-profit giving back to a corporate? It’s completely turned the model on its head,” says Robinson. Relate’s vision is to have every employed, tax-paying South African buy one bracelet each year and, in doing so, annually raise a quarter of a billion rand for good causes. Relate faces numerous challenges. Establishing retail partnerships is difficult, with the positioning of bracelets in stores is critical to strategy. Reaching decision makers in top management of corporates to this end is oftentimes hard. Furthermore, brand upliftment, brand awareness and brand education is crucial; informing and getting consumers to understand the non-profit goal of Relate bracelets is important. Robinson believes the business model is sustainable. Relate is currently a small brand but he says they want to grow it in South Africa’s heart. The plan is to create micro-franchises in the market that sell the product. Relate has sold 1.7bn bracelets and raised R27m in five years, according to Robinson. In 10 years’ time he hopes Relate will be a well-known, equitable, proudly South African brand, employing 3 000 women and 270 youth, with expansion beyond the Western Cape to the Eastern Cape and Gauteng. Relate also hopes to move beyond creating bracelets. There are plans to introduce other beaded products, while maintaining the ‘raw skills’ element of the programme, without turning it into a manufacturing plant or factory. Relate’s vision is to have every employed, tax-paying South African buy a bracelet per year and, in doing so, annually raising a quarter of a billion rand for good causes.. “You can literally turn around some of the biggest challenges in this country,” concludes Robinson. This article was featured in Finweek magazine and republished by Lameez's Pieces on 19 September 2015.